Credit where it’s due to The Hong Kong Massacre for not beating about the bush with its premise. Or anything else, for that matter. Even the title is Ronseal-approved, summarising the entire game in one simple if rather alarming line. 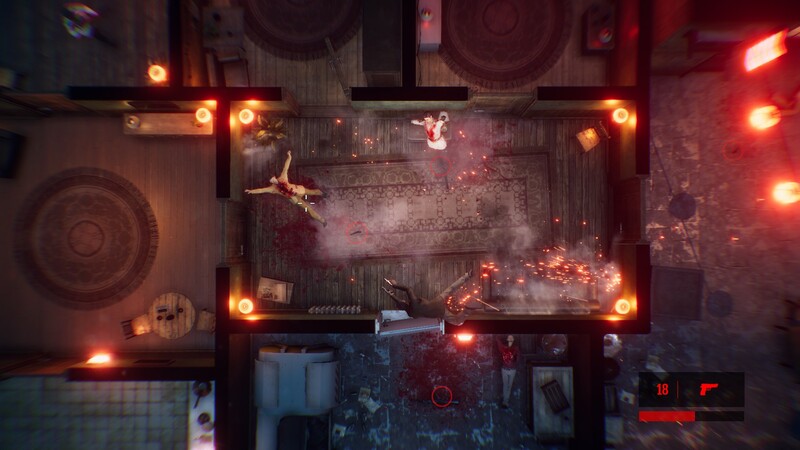 This is, essentially, Hotline Miami by way of Hard Boiled, a game of breaking into buildings and blasting everyone inside with whatever weapon comes to hand. One shot kills anything, including you, so you need to be simultaneously a crack shot and a slippery target. The Hong Kong Massacre differs in one significant aspect to Hotline Miami, however, and, well, it’s a weird one. It’s a difference that is both essential to the game and the source of its most damaging flaw. Ooh, suspense. Before we get into that, however, let’s briefly go over what The Hong Kong Massacre is about. It’s killing people. That’s what it’s about. Just flat out murdering dudes for fun. Alright, alright. Somewhere amidst all the blood and bullets is a tale of vengeance. But I’m going to be honest, I have no idea what the specifics are. This isn’t entirely my fault, because the game doesn’t seem to care much about its own story either. 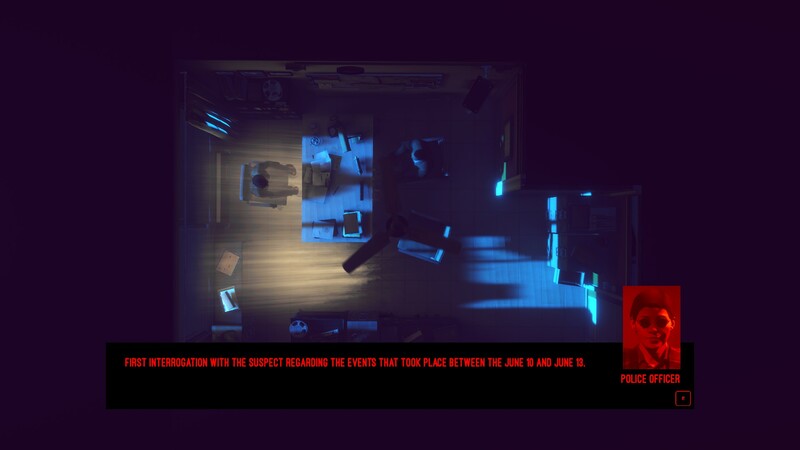 I do know that it starts at the end, with your character being interviewed by a police detective, and then works through the events of the preceding four days, each of which constitutes a chapter of the game. The writing is utterly terrible, with characters talking to one another like anthropomorphic plot devices. 'Okay, let’s move onto the next plot point.' 'Yes, let us do that please.' You might think this is an irrelevant criticism given the nature of the game, but it’s worth remembering that the original Hotline Miami had an intriguing approach to storytelling. The Hong Kong Massacre, on the other hand, does not. What it does have is action by the bucket and style to go with it. Like Hard Boiled, The Hong Kong Massacre presents a highly exaggerated interpretation of what happens when a bullet strikes an object. 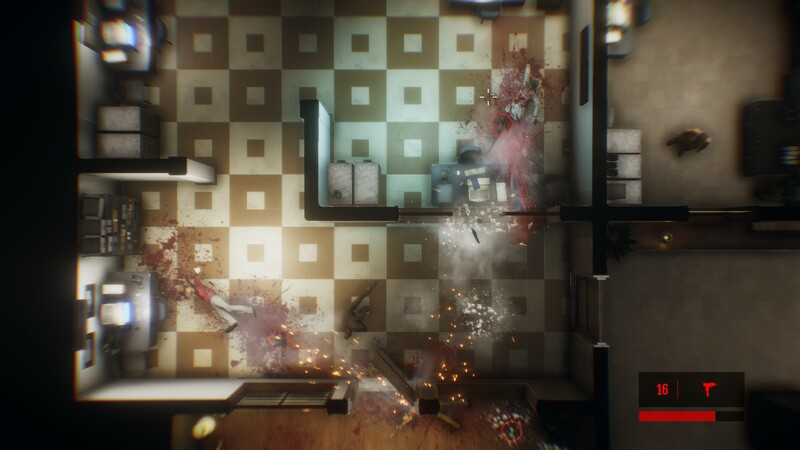 During a THKM gunfight, windows shatter in showers of glass, while wooden objects like doors and wall-panels practically vomit-out splinters. Hitting an enemy causes them to almost burst like a blood-filled balloon, and basically everything emits sparks even if it’s not made of metal. When THKM’s battles are in full-swing the game looks spectacular. The flashy style also extends beyond the missions, which are often separated by brief, silent cutscenes of the protagonist driving, his windshield reflecting the harsh neon glare of Hong Kong. The music is a combination of pulsing bass and thrumming steel guitar strings, lending the game a threatening atmosphere. In the few moments when the game isn’t a torrent of particle effects, however, a level of amateurishness is visible. Animations are rubbery, and the textures look like they’ve been smeared with Vaseline. It’s a visually striking game, but it’s not always a pretty one. The action, meanwhile, is simple but entertaining. Most of the time you only need to worry about three things: moving, shooting, and dodging. The latter is particularly vital to remember. If a bullet so much as grazes you, you’re dead, but dodging lets you roll and slide beneath bullet trajectories. Moreover, when dodging your character will automatically slide across raised surfaces like tables or kitchen units, which is a neat touch. 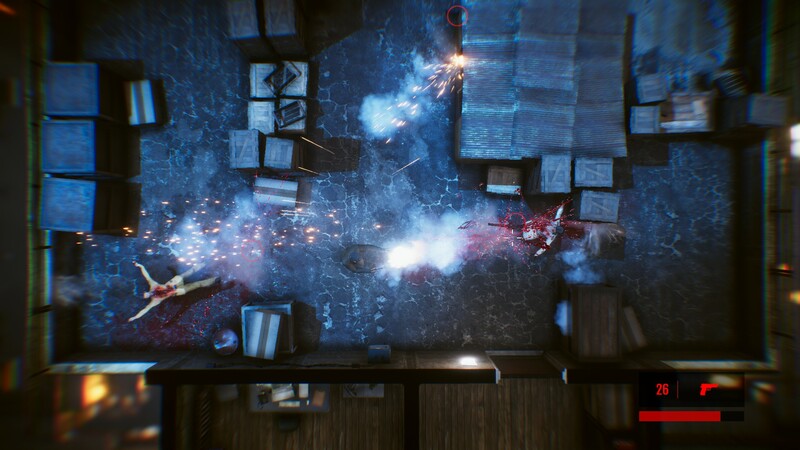 No John Woo-inspired game would be complete without a bullet-time mechanic, and in this THKM doesn’t disappoint. It’s a classic implementation of the system, slowing time down for both you and enemies, but letting you aim at regular speed. It both looks and feels great; charging into an enemy room and popping three enemy heads in slow-motion is very satisfying. Unfortunately, THKM’s bullet-time also makes the game far, far too easy. It’s not simply the fact that it slows down time, it’s that you can use it all the time. There’s a meter that supposedly acts as a restraint on your bullet-time usage, but it drains so slowly and replenishes so quickly that for all intents and purposes it’s unlimited. THKM tries to counter this in other ways. Completing each level rewards you with a star that can be used to upgrade your weapons, but each level also has three challenges that award you with additional stars for completing them. One of these challenges is to complete the level without using bullet-time. It’s a nice way to incentivise players to increase their own level of challenge without forcing it upon them. Problem is, there are only four weapons in the entire game, and there’s no real need to upgrade them since every gun kills enemies instantly anyway. Indeed, THKM other major issue is it’s a pretty anaemic game, easily completable in under three hours. In itself brevity is not an issue, but THKM doesn’t have sufficient mechanical depth to sustain it for even this short length. Once you’ve finished the first chapter, you’ve seen most of what the game has to offer. The rest is simply variations upon what’s gone before. In fairness, the base mechanics are solid enough to keep you engaged, but by the end of chapter two I was hankering for a change in pace that I never got. 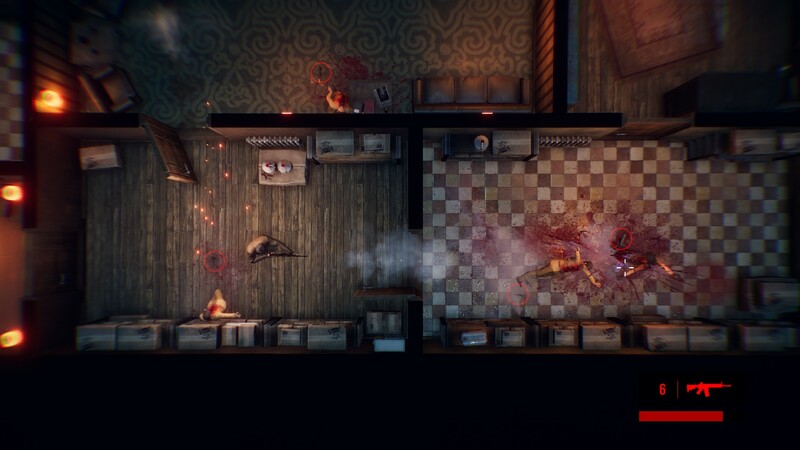 In some ways I admire The Hong-Kong Massacre’s simplicity alongside its unwavering dedication to shooting goons in the face. Yet while it does have style, it doesn’t have quite enough style to compensate for the lack of mechanical depth. 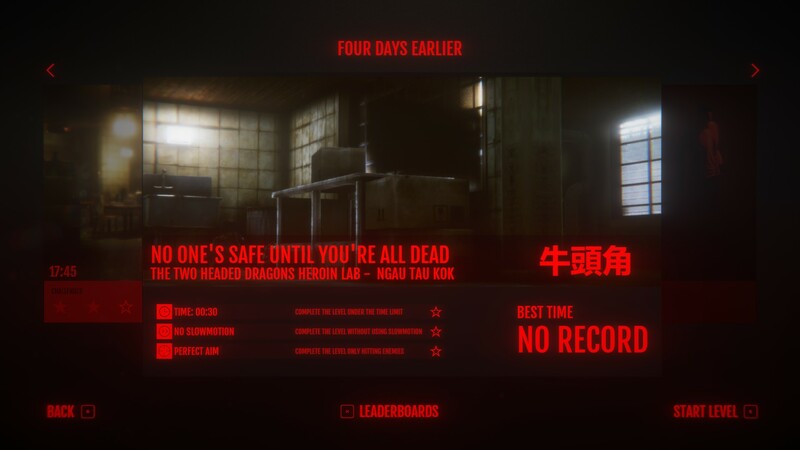 It’s far from the worst game I’ve ever played, but it’s also unlikely to be one that I remember after the last body has fallen.